A statewide interactive map featuring data from the County Natural Heritage Inventory is now available here. County Natural Heritage Inventories are designed to inform the residents of a county about their living heritage and give them a tool to use in planning the future of their communities. County and municipal planners; federal, state and local agencies; businesses; environmental consultants; developers; private citizens, local conservation organizations; and many other groups use these studies to help make land-use decisions. With increasing emphasis on planning within the Commonwealth, these studies are important for the conservation of Pennsylvania’s natural resources. County Natural Heritage Inventories showcase PNHP's conservation science efforts by combining and presenting information on important natural areas, habitat for rare plants and animals, and other important natural resources in Pennsylvania. Through detailed mapping and discussion these projects present important places within a county, prioritize them based upon their attributes, and provide recommendations regarding their management and protection. County Natural Heritage Inventories are snapshots of the known biological information available to PNHP at the time of the study and, therefore, some areas may have been overlooked. Please use this form to send us information about potential natural areas and rare species habitat. 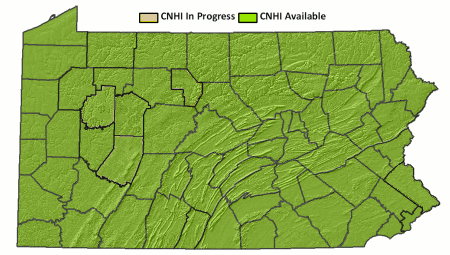 * Inventory reports for Bucks and Montgomery counties were produced by the Morris Arboretum, but are not linked to the PNHP interactive map due to mapping inconsistencies with other PNHP County Natural Heritage Inventory reports.